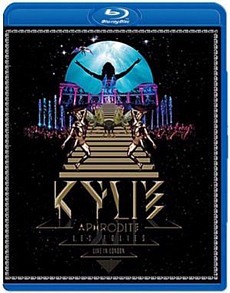 Kylie - Aphrodite Les Folies - Live in London 3D Blu-ray Review. In the end, Aphrodite Les Folies - Live in London is a must have music Blu-ray collection that showcases why Kylie Minogue is one of the world's penultimate performers. This Blu-ray music spectacular filmed at London's O2 Arena over two nights features one of the worlds most amazing pop stars... Kylie Minogue. However after watching this amazing concert, especially in 3D, Kylie will be elevated from pop princess to pop goddess as she is transformed into Aphrodite herself. Even the beginning of the concert is based on Botticelli's Birth of Venus as Kylie emerges from a golden seashell with some amazing visuals of swimmers underwater to complete her "birth". This two hour concert (excuse the pun) almost makes you feel like you are part of the crowd and next to the goddess herself as it brings together tacks from her latest platinum selling album APHRODITE, including some of her other hits that include Can't Get You Out of My Head and Spinning Around. This Blu-ray collection comes on two discs which includes the 3D version on one disc and the 2D version of the other with a very cool documentary entitled Just Add Water. The 3D looks amazing on Blu-ray and the filmmakers have captured some truly standout moments which really jump out at you. Considering that they collected around 40 hours of footage, it's easy to see why this is such a slick presentation. Before I get to the extravagant visuals of the concert, there are a total of 26 tracks included in the presentation which sound phenomenal through a surround sound system. Once again the cliché of feeling like you are at the concert comes into play when these songs are booming out of your home theatre speakers. In relation to audio quality, this release comes in PCM Stereo, Dolby Digital 5.1 and DTS-HD Master Audio 5.1 that bring out the clarity of Kylie's amazing voice and needless to say, you won't experience anything like it, unless your fortunate to have a one-on-one with Kylie Minogue unplugged. A special mention should also be made to Roxy and Lucy, Kylie's backing singers who perfectly complement her vocals and it's great to see them part of the performances as well. The performances... wow, I don't think I have seen a concert that has been so well choreographed. Firstly, the set is quite amazing and looks like it has been taken directly from the Greek Pantheon. Ten you have the colourful costumes with more glitter and glam then the Sydney Mardi Gras combined. Interestingly enough, some of the costumes were actually created by Dolce & Gabbana which is why they jump out at you. Complementing the costumes is the choreography with the perfect physique of the dancers as they play powerful ancient Greek Soldiers (ala 300) and beautiful scantily clad nymph-like goddesses with some acrobatics and ballet routines thrown in for good measures. When combined with the concerts special effects and the music, it's a truly surreal and memorable experience. From a golden winged Pegasus to the spectacular water-feature finale, you'll enjoy every minute of Kylie's Aphrodite Les Folies - Live in London concert that will excite all your senses. In the end, Aphrodite Les Folies - Live in London is a must have music Blu-ray collection that showcases why Kylie Minogue is one of the world's penultimate performers. And as a bonus, the second disc comes with a small book with photos from the concert, a mobile app trailer that promotes a very cool Kylie app for your iPhone or iPod Touch and a great documentary entitled Just Add Water. This documentary goes into some detail about the creation of this tour plus some very cool interviews with Kylie. It's definitely a must watch documentary and more importantly, this is one Blu-ray that can be watched over and over again. So what are you waiting for? Go out and buy this Blu-ray now!